Online platform offering freight quotes from hundreds of carriers wins prestigious web award. This is the best site I've seen so far. I can tell what your business is. You use the site to accomplish everything you need to do. Freightopolis, the first and only website offering real time freight quotes from hundreds of North American carriers, just won the 2013 Best Transportation Website Web Award. The WebAwards program is the standards-defining competition that sets benchmarks for the best web sites. Freightopolis came above industry standards and achieved a near perfect score in all categories. 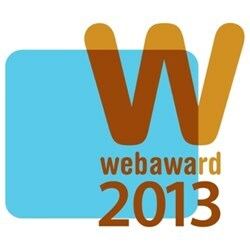 As a WebAwards' judge said: “This is the best site I've seen so far. I can tell what your business is. You use the site to accomplish everything you need to do. It's interactive. Nice job." Now in its 17th year, the WebAwards program is the longest running annual website award competition dedicated to naming the best web sites in 96 industries while setting the standard of excellence for all website development. Freightopolis.com was the sole winner of “Best Transportation Website”, in a category covering freight, public transportation, airlines, airports, cars and anything else transport related. Previous winners in the transportation category include FedEx, General Motors and Honda. Freightopolis is a Montreal-based innovative freight shipping and management platform offering real-time quotes from hundreds of full truckload and LTL transport carriers. It serves manufacturers, distributors, wholesalers, importers and other businesses that ship freight in Canada and across the Canada-US border. Freightopolis customers get live competitive freight rates direct from transportation companies and tracking numbers for every shipment. The system automatically generates bills of lading, proofs of delivery and invoices. It also allows for uploading customs documentation. The owner and creative genius behind the idea is transportation industry veteran Jack Pollak, who has relentlessly worked to create the Freightopolis system since 2010, and launched it in the first quarter of 2013. Six months after launch Freightopolis is offering 4 million North American freight lanes and has engaged over 2,090 shippers and 330 transport carriers, small, medium and industry leading companies. Visit http://www.freightopolis.com for more information. “Founded by the Web Marketing Association in 1997, the WebAwards is the standards-defining competition that sets industry benchmarks for the best web sites based on the seven criteria of a successful website. The goal of the WebAwards is to provide a forum to recognize the people and organizations responsible for developing some of the most effective websites on the Internet today. Beyond validation, entrants benefit from a website assessment by a professional judging panel, which provides specific feedback on how each site ranks against standards of excellence.” For more information, visit http://www.webaward.org.